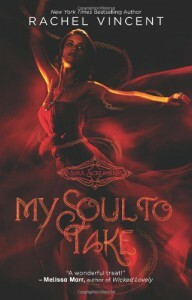 My Soul to Take by Rachel Vincent was a really interesting read, and it was completely different from anything I've ever read before; I don't think there are many novels focusing on banshees out there! "The guy on the left was a junior named Nash Hudson, whose pick of the week -- Amber-something-or-other -- was already seated. Showing up at homecoming with Nash would have been all the revenge I could ask for against Toby. But that wasn't gonna happen. I wasn't even a blip on Nash Hudson's social radar." It just doesn't seem realistic to me for Nash to come up to Kaylee after simply hearing her voice and wanting to talk to her because of bean sidhe-ness and then falling in love with her from that one night. ... *Insta-love alert! * The book takes place in about a week, and Nash and Kaylee act like they've been together for MUCH longer than that throughout the book. In the end, my absolute love for the rest of the book allowed me to overlook my annoyance at this one aspect of it. Overall, it was a very good book. I'm currently reading book 2, My Soul to Save because I have the Vol. 1 bind-up. I think (hope) that this will be one of the few long series that actually gets better with each new book! And I LOVE TOD (just saying).